New Mexico provides an abundance of cool and creative spaces to host your child’s next birthday celebration. Each of these great spots offers a fun-filled experience, from bowling alleys, to children’s museums, to ninja parks! Here are the 10 best places to celebrate your kid’s birthday in New Mexico. This is a great venue for a kid’s birthday party. Where else can you encourage kids to knock things over by rolling a ball down a lane as hard as they can? This bowling alley has been setting up pins in town since 1959, and is still locally run and family owned. There are four different options for parties. With each you get two games plus a choice of food. It’s a bring your own cake and ice cream place. Parties can only be booked on Saturday and Sunday. Minimum age is six. Jump, jump, jump, jump, jump until the kids just can’t jump anymore. And then have cake and ice cream, which you bring. 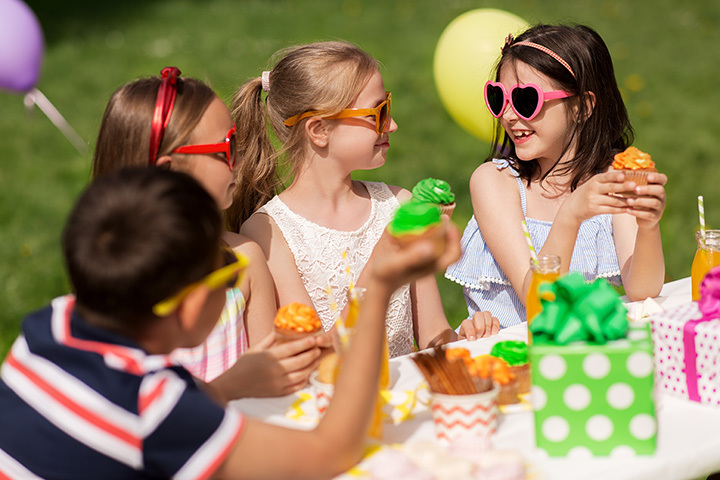 In between jumping and cake your party can include face painting, balloon animals, cartoon characters, music, cotton candy, popcorn, snow cones, and drinks. Party times are Friday, Saturday and Sunday. Choose from a selection of nine packages that vary in price. For convenience, book online option available. This indoor play area provides kids, nine years-old and younger, a place to have fun and adults a place to relax, even during a birthday party. There are VIP party rooms for a birthday celebration, but access to the entire facility, complete with LEGO room, reading nook, art bar and more, is open to all guests. With a party package, you get a personal host, free balloons, free downloadable invitations, and one free return play pass for the birthday boy or girl. Bring your own food, cake and decorations. Moms and Dads can get a latte at the coffee bar, too. Avoid the birthday party set-up hassle by letting the folks here do it all for you. At the end of the celebration you just get to walk away with the leftover cake! You get two hours in the party room, plus an appearance from a special character like Peppa Pig, Elmo, a princess or dinosaur, as well as a goodie bag, access to one free activity and entry into the birthday box registry for special offers. There are educational activities throughout for hands-on fun, too. You can’t beat a bowling alley for a birthday party! Kids can be loud, noisy, jump up and down, toss a ball and, what happens, everyone cheers! This 12-lane bowling center offers special deals on lane use for kids’ parties. You get to bring all the things that make a party fun: cake, ice cream, decorations and goodie bags. There’s a good restaurant and the inside scoop is that the pizza is the food to get. When the kids are tired of bowling there’s an arcade with video games and air hockey. This play area brings the best of the outside inside. Climbing, spinning, jumping and sliding all happen in a larger-than-life indoor inflatable playground—no ants, no weather issues, no wind blowing the tablecloth away. Host a private birthday party at this spacious and fun venue and the courteous and accommodating staff will make it a day your child won’t forget. You bring the food and they supply the fun. Choose from a variety of party packages. Science, technology, engineering, art or math at a birthday party? Absolutely. Choose a party to suit the age of your child. Children ages two to six have fun with colors, concoctions, mirrors and pinwheels. Ages seven and up experiment with electricity, liquid nitrogen, kaleidoscopes and plastic. Any birthday party package includes access to a private room, an educational activity, face painting, wristbands for all day Explora admission and staff to help. You just bring the food and non-alcoholic drinks. Lots of learning, lots of fun. Imagine all the possibilities for fun at a two-hour private birthday party—the museum is yours and only yours— in a place that has 35 interactive indoor and outdoor exhibits that include a dress-up area, puppet theater, magnetic building tables and an acre-and-a-half of outdoor garden space. That’s one option on a day the museum is closed. You can also rent the party room during regular business hours for a few hours, and still get access to the all of the museum’s exhibits. In both packages the birthday boy or girl is King or Queen for the day and gets a very special throne seat. Score a perfect 10 with a birthday party at this gymnastics studio. Two trained teachers will help party-goers for one hour with a variety of activities including bouncing on the trampoline, rope climbing, swinging on the uneven bars, running an obstacle course, tumbling and parachuting. All you have to bring is the cake. Parties can only be booked on Saturday and Sunday afternoons. Kids won’t fly or drop down from the ceiling at this indoor obstacle fitness gym, but they will get to scale a climbing wall, swing on rings and run across a rope ladder and pretend they’re on American Ninja Warrior. Coaches help kids navigate the course. Choose from a couple of different birthday party packages based on number of participants. All include an hour of play time, pizza, drinks, plates, utensils, email invitations and decorations. Book a private party and have the place all to yourself. Party time availability only on Saturday and Sunday. Remember to bring the cake!